From the basic Rotaflow RO-C model, which is very compact and will fit behind every tractor, to the Vicon RO-EDW top of the range model, there is an option for you. 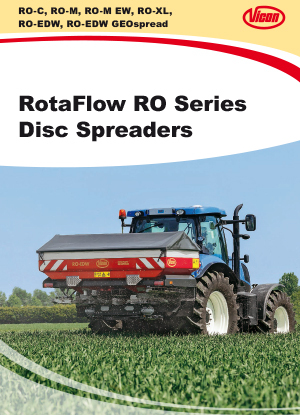 The Rotaflow EDW spreader features the unique reference sensor weighing system which will correct automatically on slopes and for shocks. Therefore, this spreader can work with high accuracy on rough terrains and in hilly conditions. 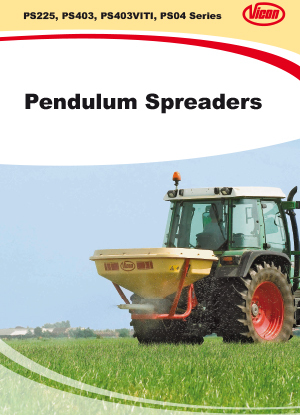 Speed related spreading, with auto calibration, will help to prevent over and under dosing which will result in better yields and saving of fertiliser. For even more saving of fertiliser and also more comfort, it is possible to use the spreader in combination with GPS. Or for true profitability the GEOspread system does section control with sections of only 2 metres. With a maximum of only 24 sections and the possibility to switch sections over the middle, unnecessary overlap is set to an absolute minimum. The total benefit of GEOspread combined with speed related spreading and GEOpoint headland management can be up to 15%. This can be achieved by saving fertiliser and better yields, because of no unnecessary overlap. The Vicon pendulum varispreader is the first choice wherever the demand is for maximum spreading quality and ease of operation. With hopper capacities of 600, 800 and 1000 with the 604 hopper as a basic hopper and 750, 950, 1150, 1350 and 1650 litres with the 754 as a basic hopper, Vicon is offering you a wide range of different models and hopper capacities. Spreading along field edges and tram line border spreading is no problem at all thanks to the border spreading plate and the tiltable headstock.